We’re delighted to be working with The Once again! Newfoundland has a storied history of stunning songwriters, poets and players. Over the course of the last decade The Once have writ and knit themselves into that story. Within the nine songs on their new album Time Enough, The Once offer some of the most vulnerable and honest material of their career. The up-tempo album opener, I Can’t Live Without You, reflects on women battling with self-image issues and offers wisened words to be the positive change in their own lives. The gritty guitar driven Before The Fall succumbs to the notion that we must accept our past and use those memories to grow. Riff rocker Any Other Way reflects the fact that true love accepts us at our worst but insists we do the work to be our best selves to keep it together. On this, their fourth studio album, the band stays true to the root strength of their harmony driven sound, while extending the borders into fresh yet familiar territory. They craft a sonically understated, but emotionally fulsome sound that accomplishes what they’ve always done so well: stun listeners with what Amelia Curran calls ‘perfect vocal harmonies, thick enough to stand on’. Since first hitting the road in 2009, The Once has earned one of the most loyal followings in the country. Ask their fans why they love the band and watch their eyes widen as the words flow. It becomes clear that The Once ain’t regular folk. They’ve built something unique within their genre, and something rare within the fan base that keeps them growing and going strong and they do not take that fan base for granted. ‘We give all we got to them because we know we can’t do what we want to do if they’re not with us,’ says Hollett of those who have shown endless support for the group. It was this resonance with fans that launched their career and it is this deep relationship that continues to inspire the band to travel new paths, explore new territory, and create new music. 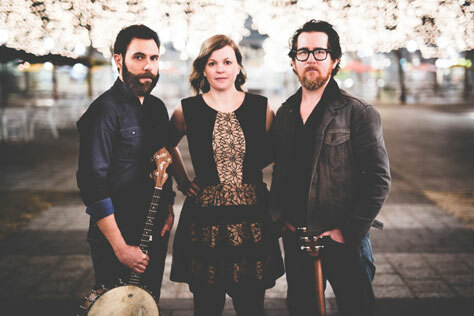 Geraldine Hollett’s voice is a large part of the band’s ethereal sound, and there is nowhere it would sit better than in between the rhythmic and supportive voices of Phil Churchill and Andrew Dale, and the lush soundscapes they build. The trio’s instrumentation and vocals meld together like gold, building something stronger together than any one songwriter could muster alone. Their harmonies grab you by the heart, and their music melts what’s left of it. Building on the wave of creative energy that defined their last album, Time Enough is a striking and subtle sea change for the band. Dive in, get lost, click repeat.